In this follow-up to Emily’s previous post on chia pudding, I present to you another discovery inspired by our seasonal meanderings: the smoothie bowl. The concept is nothing new, indeed, I’ve been “eating” my smoothies with a spoon for months. But last February, fuelled by visions of pudding, marmalade, and sheep yogurt, we decided to try serving our traditional breakfast smoothie in a bowl. This was a total smoothie breakthrough! Not life-changing, but definitely smoothie-changing. Why? It’s all about Garnish Potential. 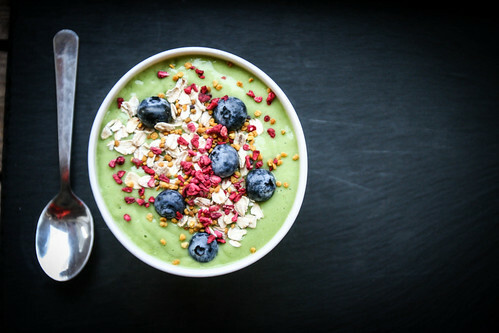 A smoothie bowl maximises space for toppings, and also turns your smoothie into something that mentally might seem like a snack into a meal in itself. If you’re using seeds, grains and/or psyllium husks to thicken your smoothie, here’s a hefty tip: blend the smoothie for 20 seconds, then let the smoothie “rest” for a few minutes (this gives everything a chance to absorb the liquid), then blend again for another 20 seconds. The transformation is kind of insane – it goes from being a sort of thick but slightly grainy smoothie into something that’s almost like super smooth pudding. This might not suit everyone’s tastes, but for me it makes the smoothie seem more substantial. This is healthy emotional eating! It also helps to use a good blender if you can – I’ve been working with the Froothie Optimum 9200 which is pretty dang powerful and also has a “20-second” button which is handy. However you like your smoothies, I challenge you to try serving your next smoothie in a bowl and eating it with a spoon – you can do this with fresh juices, too. Think about it as an opportunity to slow down and really savor the awesome blend you’ve created. After all, digestion begins in the mouth, so it’s worth taking it slow. Here’s my go-to smoothie bowl that I have for breakfast on most days. My favourite smoothie bowl toppings for this blend are berries, oats and coconut flakes, but anything goes – see my 16 Ways to Garnish a Smoothie for inspiration. Blender Method: Chop all the veg into chunks and add to the blender with the cucumber and pineapple at the bottom. Add a splash of water and start blending; add more water as needed to get it blending but you should use very little, otherwise your smoothie will be a little insipid (you can also use coconut water or other liquid of your choosing). Blend for 20-seconds, let it rest for a few minutes, then blend again for another 20-seconds. (You can add ice cubes to the second round of blending if you’d like to cool it down a bit.) Serve in a bowl garnished with smoothie bowl toppings of your choice. Enjoy! Juicer / Blender Method: Juice the pineapple, lime, spinach, celery and cucumber (I use an Optimum 600 Slow Juicer). Add the juice to a blender with the banana, flax and psyllium. Blend for 20-seconds, let it rest for a few minutes, then blend again for another 20-seconds. (You can add ice cubes to the second round of blending if you’d like to cool it down a bit.) 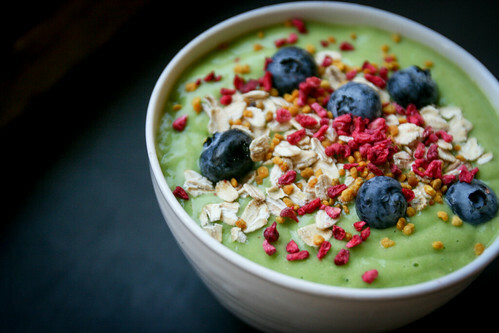 Serve in a bowl garnished with smoothie bowl toppings of your choice. Enjoy!